Since my nails have decided to gain some strength & length I've been making the most of my nails so far this year. 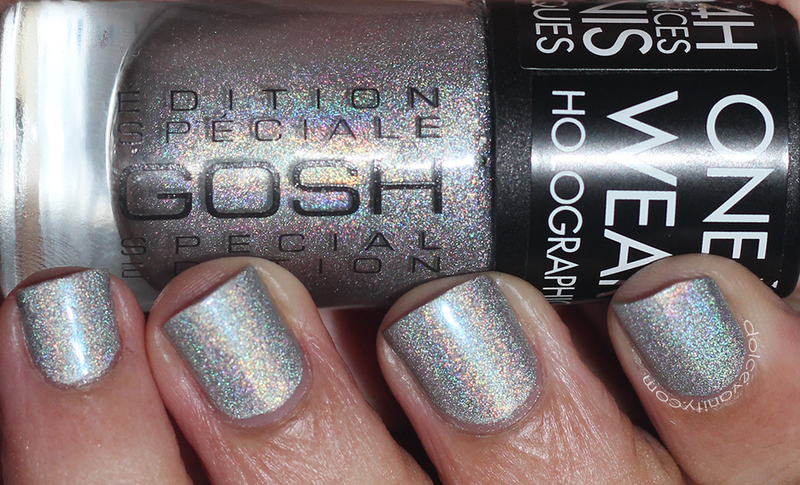 I've had the GOSH Cosmetics Holographic Hero (£3.99) within my collection for a little while after being gifted this by Grace (All That Slap) but just didn't think it looked good on the length my nails were before - personal preference - besides the fact that one nail chipped and I'm refusing to cut it until it's grown a bit more so I've kept the length. I like that this colour makes a change and I got compliments from when I first put this on that it's a nice & unsual colour. I have to agree. The hologram effect is lovely when in full force, I used my Revlon Quick Dry Top Coat, unfortunately I did notice it wasn't as vibrant with a top coat on but it does show up when the light hits. Being that it's only the second day and I've already got a chip running through my nail. Have you tried this colour or any other from GOSH? I'd love to read any other recommendations. I bought this last year and I absolutely adore it. Whenever I wear it I can't stop looking at my nails! This is very pretty! I need to get my hands on this lol.